I have some exciting news to share with you today. I have signed up to complete the London to Paris triathlon in September of 2015. This event is known as the Enduroman Arch to Arc ultra-distance Triathlon. Starting with a 140km run from London's Marble Arch to Dover on the Kent coast, then the 34km English Channel swim to the French coast, it finishes with a 290km cycle from Calais to the Arc de Triomphe in Paris. The sheer distance of this triathlon is why only 13 athletes to date have ever completed the distance. The world record currently stands at 73 hours 39 minutes and is held by Englishman Mark Bayliss. I will be attempting this record! Since deciding to hang up my togs and retire from swimming earlier this year in January, I'd started to fall into a bad place. I had no goals and had lost all motivation to do any form of exercise anymore. You hear all the time about ex professional athletes suffering depression after retiring and having a hard time trying to adjust to life after their careers. I thought for sure this wouldn't happen to me. I had a loving family, beautiful girlfriend and supportive friends. I had nothing at all to be depressed about, but it was happening. I was too embarrassed to speak to anyone about it because I didn't want to be seen as weak or have people change the way they thought of me. Every month it seemed to get a little worse. I was very unsocial, moody and completely unmotivated to do anything. I guess September was the turning point. A few things happened in this month one after another that made me think I can't keep going like this, something has to change. I really had two options: I could have stayed on the path I was on or I could try and get my life back in order by setting myself some new goals and challenges. On a recent trip to England with one of my friends I heard about this crazy triathlon athletes did from London to Paris. It got me thinking would I be able to do something like that? Being an endurance athlete I really couldn't see a better endurance event then this ultra-distance triathlon to make my new goal. I already have the connection with the English Channel so it made sense. What will be my biggest challenges? Not having ever run seriously before or having never ridden a road bike will definitely be my two biggest challenges. I'll spend the next 6 to 8 months learning the ropes on the bike and getting my running technique down pat. From there I'll slowly start building up the kms. I could have booked in for 2014 but decided to hold off for 2015 as I'm going to give this thing a real crack! Whereas before when I was swimming I was a 'professional' athlete, things this time around will be very different. I now have a full time job and my part time coaching on top of that, so I obviously have to work my training in around all of that. Time management will play a big roll but that's what excites me about this new challenge. I thrive on that feeling of being under pressure. When things seem near impossible, it's when I perform my best. I'll keep regular blogs and updates between now and race day to let everyone know how I'm traveling. You can also follow my journey on Facebook. 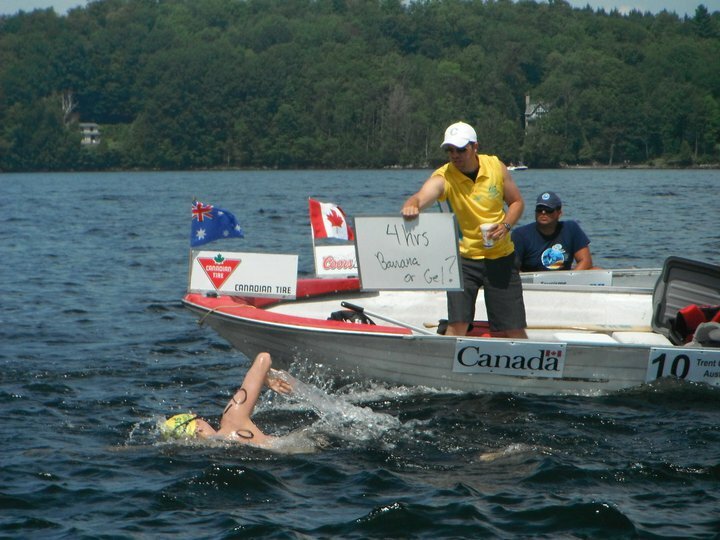 Make sure you 'like' my page: Trent Grimsey - Marathon Swimmer. Mate coming from an Ironman, this is on another planet. I tip my hat to you sir. Good luck. I look forward to following your journey. Wishing you all the best Trent, you certainly have a good chance at beating the current record if the weather holds up. I'm booked on the on week of 22 Aug 2015 tide of the A2A and with a ultra-tri background, for me the swim will be the major challenge. If you stop over in Dubai let me know and we can put in some trainings miles together. Trent, thank you for your candidness and honesty. After big swims and enterprises, we tend to fall into a bit of an aimless slump and it's natural to find it difficult to adjust; I can't even imagine what it must be like to look back at the pressure of the EC record and have no goals in sight. But the really amazing people are the ones who have grit and determination and eventually manage to slug along and get out of the bad place. Many, many folks have been there. It's okay to be there, and it takes a special person (like you) to climb out of there. Best of luck on your new challenge and on the internal change for the better it will produce. Good luck for your Arch to Arc, will you be wearing a wetsuit to cross the channel?